Tractors Owned: '49 Cub "Jessie"
Just got in from the first run of plowings for this storm. Maybe 8 inches on the ground so far. The temp is 8 degrees, so the snow is powder dry and light. I'll plow each time the town plow comes by so as to keep up with mountains of snow he leaves at the end of our two driveways and around the mailbox. No photos (Sorry, Ricky), but I'll get some tomorrow. "64 Farmall Cub (#224657) "Alex"
Time to fill the water jugs for sure. They say that 40,000,000 people are affected by this storm in the northeast. If we have bad power outages were in big trouble. I don't need power to survive. Well we all will be camping for months way beyond the sandy people. I hope it doesn't get that bad. I snapped a couple of pictures, but blizzard conditions don't make for good pictures till it stops. It was above freezing when I got home from work, so I pushed the heavy snow (~3") before it froze up. Gonna need a snowmobile helmet if I go out again, it's pretty gnarly out there! Northeast winds with snow are one of the things I have learned about over the years..... BIG snow and winds. Whew! I just got my Gravely back together. The snow cannon, as Lurker Carl has deemed it, is a central part of my snow removal system. I took the carb off and dropped it off to be rebuilt since I was short of time. It was not done but I came home with a kit- but it was the wrong kit. I had a new carb with pressed in seats- not rebuild friendly. I came home with a rebuilt carb on very greasy roads. it was warm this morning so the first layer compressed to wet ice. A good afternoon to get anti-lock brakes. I still need to go to my mother's house to help her get ready for bed. I have a short window before blizzard conditions set in. i just came in after making a couple of passes just to keep up with the storm. it's very light stuff, real easy to push. Goraidh (Jeff) wrote: Just got in from the first run of plowings for this storm. Maybe 8 inches on the ground so far. The temp is 8 degrees, so the snow is powder dry and light. I'll plow each time the town plow comes by so as to keep up with mountains of snow he leaves at the end of our two driveways and around the mailbox. No photos (Sorry, Ricky), but I'll get some tomorrow. The good thing about it being cold is the snow is light, easy to push and doesn't bring down power lines. ...just got in from seeing how much snow was on the ground. Interesting drive home from my mother's just now. Visibility was so bad I drove right by my street and I had to turn around. Passable with 4WD only. Saw a few that had to learn the hard way. Kirk, you need a front plow for that tractor! Saw one on a Ford @ Chinqua-Penn Plantation years ago. Looks just like that up in Stafford. The boys were out trying to clear the driveway but finally gave it up (wouldn't listen to their old man). The girls are looking out the window with excited expectation at sledding tomorrow. Looks like just over two feet here. Going to be a long slow clean up. Buzzard Wing wrote: Northeast winds with snow are one of the things I have learned about over the years..... BIG snow and winds. Bob, how are you guys doing up there? They say potentially another 8 inches in some areas later today, high winds and drifting throughout the day! My daughter, son-in-law and grand kids live in Hamden. My son-in-law said he would send a picture of the cars, but you can't see them. I offered him a snowblower a few years ago, but he said they don't get much snow. I bet he is rethinking that now. 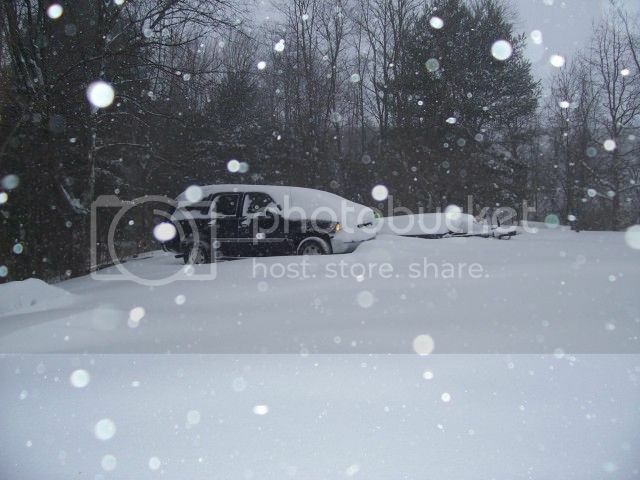 i just got in from plowing, hard to tell how much with the drifts but it 1 to 3 ft. its like plowing a big wave of powder. we're lucky its light. Last edited by Rob in NH on Sat Feb 09, 2013 9:28 am, edited 1 time in total.